As a vegetarian, I eat a lot of soy-type products. I'll have to give this one a try. I have been struggling with health issues for most of my life, and I love junk food just as much as the next one, but I recently discovered a health snack I love! 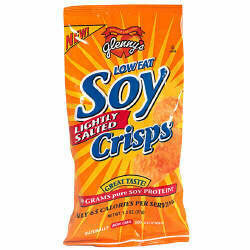 They are Glenny's Low Fat Soy Crips! They remind me a bit like rice cakes, but without the cardboard texture and flavorless taste. I personally love the Apple Cinnamon, Lightly Salted and Cheddar Cheese. They have multiple other choices, these are just a few of my favorites!